When my parents got married and bought their first house, it came with an old hoosier cabinet. Somehow, the cabinet made its way to my grandmother's house, where it stayed for many years. When one of my older brothers got married, the cabinet traveled to his new home. I had my eye on it for a very long time, and my brother passed it down to me when my husband and I bought our first home. I simply adore the fact that it was passed down through the family and eventually found its way to me. To make it even more special, my grandma gave me lots of treasures to fill the cabinet. This is my favorite piece of furniture and everyone who sees it seems to fall in love with it as well. I have always been one for antiques and vintage items over anything new, so this is such a treasured piece. I think it's so special when the items you surround yourself with have a deep, personal history. 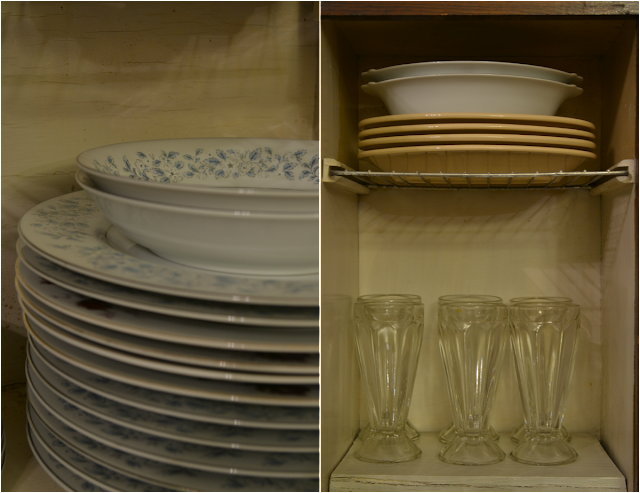 I'm so nostalgic and love to imagine my grandmother using the cabinet and china in her day. I often wonder how many times she washed these dishes and replaced them in the cabinet after a long, tiring, but hopefully happy day. Do you have any treasured hand-me-downs in your home? It's gorgeous and I love that you truly appreciate it. I don't have any hand-me-downs, but there are a few vintage things (lamps, figurines, etc) that my mother has written into her will for me (although, hopefully it's a VERY long time before I get any of them). Tammy, I love your Hoosier cabinet!! (And I'm lucky enough to have one too!) I also love the beautiful treasures that fill yours-like your silver! Your Hoosier cabinet is so charming! 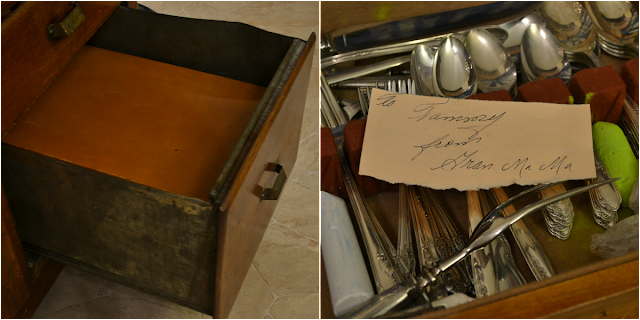 How nice to have a family heirloom in your home and filled with goodies. I am fortunate to have a few antiques from my parent's home. Pieces like yours have so much character. Oh I love it! I would cherish that too! I know what you mean. Uncle Oscar made a lovely, solid wood cabinet some years ago in his shop. I think he used it to house electronics, but the copper pulls and simple design made it perfect for a kitchen cabinet when I inherited it. Also, Sean's Grandma Re left us her hutch and Moosehead Kitchen Table. I often think of them both, though they are gone now, when I take things out of a drawer or down from a shelf. And, it makes me smile. That cabinet is a great piece! I have dishes from both my grandmothers. Not a full set, but special little pieces that I have displayed in the house. Your cabinet is wonderful and so special since it's from family. Those kind of pieces are the best because they're so full of memories. I have some things from my Grandmother that I cherish. what a treasure ~ always loved those Hoosier cabinets ~ this one is special because it has stayed in your family ~ Wow! What a lovely cabinet!! It's so neat that it has stayed in your family! For as much traveling around your family as the Hoosier cabinet done--- it appears to be in excellent condition. If those wood panels could only talk since most happenings use to be in the kitchen!! You have yourself a treasure and I know you'll take excellent care of it!! So glad that you got it! I have one too! It was our baking station at our last house...but it doesn't fit in our new house kitchen. I'm not sure what I"m going to do with it, but I will never part with it. This is a great piece of furniture and I'm glad for you that it ended up in your home! That is beautiful. The fact that she filled it with china is so nice for you. I have my mother's silver-ware and I use it at every family occasion. I think you will find that you will treasure your grandmothers. Love the cabinet. Did you see the cup board withe the winter dessert dishes in my open house post? It was salvaged off the back porch of a house being torn down. The top was gone, the flour drawer popped off, and the back in poor repair. Hubs practically rebuilt it and now it's a treasured piece. I have an old Hoosier cabinet. Mine is not in as great a shape as yours. Yours has been very well taken care of. I do have some quilts and lamps that were passed down to me. Your Hoosier cabinet is a beauty. I just love the aged patina of the wood. Thanks so much for dropping by L'Heure Bleue At Home. That is lovely, what a treasure! I have cookbooks from both of my grandmothers, and I love just reading through them and seeing the notes they added, and what their favorite recipes were! What a wonderful treasure!! My home is full of hand me downs...flea market finds and thrift store items...I wouldn't have it any other way! I love the note you have in there from your Grandmama!! What a gorgeous treasure and friend! There is nothing like an old vintage piece that's been passed down through generations. I have my Grandmothers wedding china. It's almost 80 years old and there is still a full serving for eight. I feel honored to have it and I enjoy using it for the holidays. Such a wonderful piece and you've decorated it perfectly. The hoosier is a beautiful piece and even more wonderful that it has been handed down in the family. I have always wanted one. I do have an old, old desk that was my grandmothers that I treasure. The hoosier looks like a good piece of workmanship . I bet those dishes have a tale or two to tell. Glad it was passed down to you eventually. That is a great cabinet. I have one very similar that was my Great Grandmothers. I keep begging my hubs to move it to the window so I can photograph food on it. Yours looks lovely! Have a Merry Christmas! That sure is a eye catcher and a keeper. How nice you have it. Some grownups your age would pass the thought of having it . Your a very appreciatve person. OH.MY.STARS. I have hoosier envy like you wouldn't believe. Someday I hope to own one. How wonderful that you have a piece of your family's history to admire and cherish each day. Enjoy it, girl! beautiful piece of furniture....how lucky you are to have received it! my fovorite hand me down is also from my grandma. it is an old silver platter that my uncle gave to me on my wedding day. i was so happy to have received it and it is centerstage in my china cabinet! This is beautiful - I love the note from your Grandma!!! That is wonderful! What a special thing to have. this is incredibly pretty!! that sure is a keeper! love those china treasures, too. love vintage anything, this post was a delight to read/see..
Beautiful and so special! I would love it if you would share this on Wednesday when I premier my Farmhouse Style Blog Hop at www.greeneggsandgoats.com! It's a beautiful cabinet - full of love. Glad it found its way to you! Love your hoosier...don't think I have seen one with glass in the doors, mine certainly doesn't. It makes it even more special that it has been passed down in your family. Thanks for sharing.